Traditionally people know what type of game they are buying/getting. 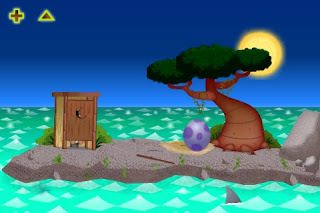 The game's background or premise is typically setup using an introduction movie. Pocket God cannot rely on people knowing the type of game, as people often download iPhone games on the spur of the moment. This leads to players not knowing what they’re getting into. This is exacerbated by not providing an introduction to the game. Welcome to the Island of Oog, on an island inside your iPod/iPhone live the Pygmies, a tiny race of people that worship an unseen force... YOU. You are their God and it is your responsibility to keep them in line and guide them through their ongoing adventures. I feel this doesn't sufficiently explain the game. The playtester thought she had to try and keep the pygmies alive/prosperous. This was why she got so upset when the pygmies started dying. The introduction needs to explain that the fun starts when you're willing to let the pygmies die, as they can be replaced easily. The intro text should be clarified, making it clearer what the aim of this game is. An introduction could also be added (this doesn't necessarily have to be a movie, it could be a series of images like Beneath a Steel Sky). I recently praised Batman Arkham Asylum for its well paced gradual introduction of controls. The problem with Pocket God is that as there's no storyline, there's no clear path through the game through which to introduce the different features. There's no storyline, all the functionality is available from the off, leading to this feeling of being overwhelmed by our playtester. 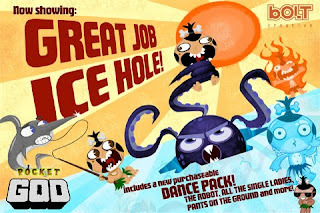 Pocket God could add a tutorial, introducing players to the different 'activities' available... But this undermines the spirit of exploration and discovery that the game relies on ("ooo look, I can throw them into the volcano!"). An alternative - I think the best way for the player to learn any game is to gradually seek out new functionality at their own pace. If Pocket God initially loaded with just 1 area available, this could act as a 'nursery' area for the player to come to terms with some of the more basic controls before allowing the player to approach the other areas in their own time, downloading them whenever they felt ready. This could also be applied to the different 'episodes'. This approach of essentially splitting the areas would allow the help text to be split up. Of the 34 pages of help, 10 are generic, 4 are for 1 area, 3 for another, 5 for a third, 3 for a fourth... and 3 for a fifth. A lot of these pages are presented when they aren't relevant - why do I care about the T-Rex when I'm in the underwater area? If the pages in the help text were context specific (only show the help text for the area I'm currently in) this would simplify the text significantly. The controls are translucent. While it makes sense to try and be as efficient with screen space on the small iPhone screen, there's a risk (as seen here) that players miss the controls entirely. I would suggest researching a little more to see how often this problem occurs with new players, and if it is a common problem to offer an option to set the controls to opaque or translucent, with opaque the default selection. What is 'Open Feint'? Is it another app? How is it related to Pocket God? None of these questions are answered sufficiently. There's no attempt to sell it at all. Imagine users as surly teenagers (several are) asking "what's in it for me?". Explain what's to be gained in signing up to this thing, e.g. See how your friends are doing by signing up to Open Feint - think Facebook meets games! (I stole the end from the Open Feint site). As a backup, ensure a negative decision can be reversed easily (I think this is already the case, but couldn't be tested as the playtester signed herself up). 6 of the help pages attempted to explain Open Feint, but do a poor job. The explanations are text heavy, and I was unable to find the pages demonstrated when I attempted to use Open Feint myself. I think this functionality needs a video (implausible on the iPhone) or explanation text in the application itself. It must be good advertising to display clearly each time the game's updated... great for return users, not so good for first-timers. As the play tester said - "Episode 29? What about the other episodes???" Option 1 - do nothing. It makes no difference to the player, this problem doesn't interfere with their play (although it does un-nerve the player slightly during their initial play). Option 2 - give the player control to advance 'episodes' at their own pace. I.e. they initially start the game in episode 1, with an option to move onto 2, 3, etc whenever they chose. Option 3 - don't show the episode number when the game is initially loaded, display only on subsequent openings of the game. This will be a common issue for many apps. 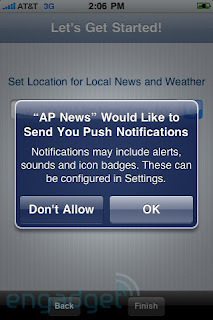 What are 'push notifications'? And even those who know what they are, how often will they be coming in? I just realised I didn't really know what they are, and after 5 minutes of studious internet research I'm now... none the wiser. I can't find much about what they are, other than they're the little red blogs apps get in their corner to let you know something's happened. Much like the Open Feint issue Apple need a 'What are push notifications?' link each time this question is asked. There should also be another link/a following page detailing exactly how the push notifications will be handled by the specific application. Allowing users to read and learn about unknowns will massively increase the likelihood of people agreeing to said unknowns (or 'knowns' as they would then be... known). I was working with a client just a couple of weeks ago who encountered the exact same problem. The 'on' selection looked very similar to the 'off' selection. This meant participants were forced to switch the option on and off several times before they could see the difference. The solution is to differentiate the two states more clearly. This could be done by changing the on/off state from a subtle glowing around the silhouette to clear colour changes. Or using ticks and crosses alongside the silhouette. Pocket God needs several changes before I could say that they support new users. It appears to have suffered game usability growing pains. Designs that were suitable initially have suffered with the increase in content. While I'm sure more experienced players will be able to overcome several of the game usability issues discussed with no problems, the issues will remain for more 'casual' gamers.